Grey Stroke-Lettering Flat Brushes series 1932 buy the Andrew Mack Brushes here, was originally made by the old "Art Sign Company" as the series 1963 Super Grey Hound. This Lettering Flats were made with Pure Grey Talahoutky Squirrel. Grey Squirrel is very hard to get today and is also very expensive. Mack Brush customers requested a reproduction of the Grey Squirrel Flat lettering brush, so created a custom blend to match the old brush do 2 things, 1 match the style and 2 keep down the cost while retaining the body and snap of Grey Squirrel Hair. This is not intended to replace Mack's series 1962 or 1992. It is merely a less expensive alternative. These Grey Stroke-Lettering Flat Brushes series 1932 are for Rougher surface and are stronger than brown hair flats, even though their a budget brush, at least that's how it was explained to me by Sign painters as a boy, so that's how I use Grey Flats (Ron Percell, 2nd generation Sign Artist). Grey Stroke-Lettering Flat Brushes series 1932 listed below. Flat Lettering Brush Grey Stroke series-1932 size 1"
Flat Lettering Brush Grey Stroke series-1932 size 1", was originally made by the old "Art Sign Company" as the series 1963 Super Grey Hound. ..
Flat Lettering Brush Grey Stroke series-1932 size 1/2"
Flat Lettering Brush Grey Stroke series-1932 size 1/2", was originally made by the old "Art Sign Company" as the series 1963 Super Grey Hound.&nb..
Flat Lettering Brush Grey Stroke series-1932 size 1/4"
Flat Lettering Brush Grey Stroke series-1932 size 1/4", was originally made by the old "Art Sign Company" as the series 1963 Super Grey Hound.&nb..
Flat Lettering Brush Grey Stroke series-1932 size 3/4"
Flat Lettering Brush Grey Stroke series-1932 size 3/4", was originally made by the old "Art Sign Company" as the series 1963 Super Grey Hound.&nb..
Flat Lettering Brush Grey Stroke series-1932 size 3/8"
Flat Lettering Brush Grey Stroke series-1932 size 3/8", was originally made by the old "Art Sign Company" as the series 1963 Super Grey Hound.&nb..
Flat Lettering Brush Grey Stroke series-1932 size 5/8"
Flat Lettering Brush Grey Stroke series-1932 size 5/8", was originally made by the old "Art Sign Company" as the series 1963 Super Grey Hound. 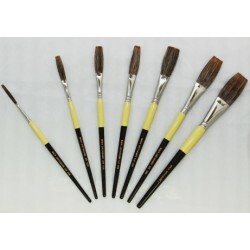 T..
Mack brush flat lettering brush grey stroke series-1932 full set, sizes 1/8 inch - 1 inch. The grey stroke was originally made by the ..